Made in France of all-natural plant cellulose material, these sponges are compressed to a flat rectangle, thin enough include in your backpack, purse, or Into the Weeds First Aid Relief Kit. 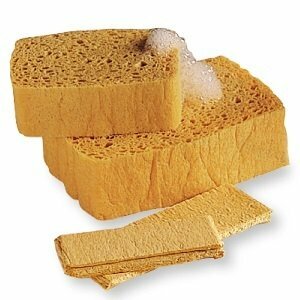 Wet and watch the sponge expand to a 4" x 3" rectangle, 1" thick. The full-size sponge has maximum absorbency, will suds up any soap and won't leave little pieces in the sink or on your skin like other sponges. Oh, and don't throw them in the compost pile too fast! Just run them through the dishwasher or laundry machine to sanitize and reuse.